United Bank Service is pleased to announce the first and only nationwide free Point of Sale program when you open an account today. Every merc hant, whether you are a new business, existing business or switching provider, has the option to receive a new PCI compliant terminal, such as the Hypercom T4220 IP/Dial ($269 value) or Go Wireless with a Nurit 8020 ($495 value). You also have the option of getting a popular free Casio Electronic Cash Register ($450 value) or a complete Point of Sale (POS) system ($3399 value). Perfect for retails, restaurants or doctor's office; these free terminal program eliminates the need to wait 30 minutes for an old terminal to be reprogrammed in the field, because every merchant, existing or new, gets a Free Terminal. The Vx510/T4220/8000 are the latest generation of state-of-the-art popular terminals. These terminals have a built-in high-speed thermal printer, internal debit pin-pad, 14.4 modem, added memory, and is IP capable, smart card compatible and Visa PED compliant. The free Nurit 8500x/8000x will also be equipped to support signature capture, check guarantee and gift card program. In addition, the most popular Casio electronic cash register was specially modified to include an advanced credit card processing reader to deliver the ultimate payment solution, completely free of charge! 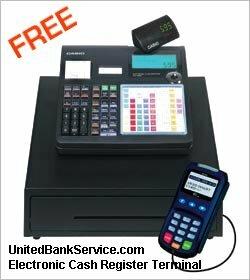 A standard credit card terminal is just a electronic swiper, but our free Electronic Cash Register (ECR) has a 3-in-1 function to accept cash/credit/debit and to manage the money, record the sales, price lookup and process credit cards in a simple and efficient manner. Your terminal is shipped by ground/air within 24 hours and with warrantee service, you can count on having it problem free with parts and labor 100% covered. New this year, we are also offering an exclusive Point of Sale (POS) system, which provides full managerial functions, remote access and off-site reservations. We will invest in your business up to $10,000 to install our POS system, if you stay with us for 5 years. Lower your rates every year. Take a snapshot of your statement today to compare and you will see a drop in the rates effective on the next cycle. To qualify as a Retail, Restaurant or Healthcare Account - Cardholder, card and card-reading terminal must be present at the point of sale (face to face with your customers 60% of the time). Card must be swiped for authorization and the full, unaltered contents of the magnetic stripe must be transmitted to receive the low discount rates. Monthly Minimum $25 NO Monthly Minimum. $25 Monthly Minimum. 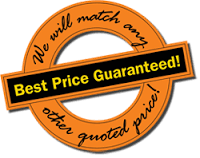 * Our goal is always to be the low price leader in every community where we operate. Visa and MasterCard has been regulated to lower the interchange rates for debit cards well below those for credit cards and we pass on the lower cost of these cards directly to merchants. Cardholder and card must be present with a check card or off-line debit. ** Keeping it just as attractive for established businesses, keeping a $25 monthly minimum of transactions will automatically waive an annual membership fee. Please make sure you have the following information available..
[ ] Provide an EMAIL address and you will receive a copy of your application. Check your email for status updates.